Are Social Networks Committing Suicide? Lots of people are finding that the popular social networking sites (Facebook, Twitter, LinkedIn) are becoming more annoying, more expensive, and less useful. Here's how I see the problem, and my take on what the future of true social networking should look like. Recently, I wrote about LinkedIn’s underhanded attempts to pry money out of job seekers, employers, and even people it invites to congratulate their colleagues on promotions or new jobs. In my RankinFile.com article Is LinkedIn Trustworthy? I mentioned that other social networks are also guilty of deviously milking members. This article goes into more detail on that subject and why I believe the social networking bubble is going to collapse under the weight of its own avarice. All of today’s major social networks – Facebook, Twitter, LinkedIn – were founded on the same business strategy. Give away services for free to gather lots of members as fast as possible, in an effort to corner the market on eyeballs. “Whoever gets biggest first, wins” is the simplest explanation of the network effect. Once you are too big to leave, you can stop depending on ad revenues alone and start charging members to use what was once free. LinkedIn invited me to congratulate a colleague who’d landed a new job, but when I tried to do so I learned the price was giving LinkedIn the password to all of my email contacts. I’ve also been hit up for $30 a month just to say “hello” to someone who appeared interesting. No, thank you, to both. Facebook gave every member two inboxes for private messages. The main inbox alerts you when new mail lands in it. The “other” inbox is more like a spam folder; messages that land in there often lie unnoticed for months. When you attempt to send a message to someone you are not “friends” with, Facebook flat-out tells you that it probably won’t be seen – unless you pay Facebook to put your message in the recipient’s main inbox. Usually, the fee is only a dollar, but on a few occasions I’ve been asked for five; the person I was trying to message wasn’t anyone special, as far as I could tell. Businesses and organizations that maintain Pages on Facebook are getting socked hard these days. The owners of these Pages worked hard to build fan bases, creating and posting engaging content that was liked and shared widely, bringing in new fans. But now, Facebook is deliberately limiting the exposure that a Page’s post gets to 1 or 2 per cent of the Page’s total fan base. So if you have 1,000 fans, perhaps only 10-20 of them will see what you post in their Newsfeeds. That’s down from 16 per cent two years ago, before Facebook began the slow, subtle throttling of this free marketing channel. The solution that Facebook offers is to pay for greater exposure. Some huge brands, like Nike, may be willing and able to do so. But many small businesses and nonprofit organizations are watching their interactions with fans dwindle by 80 per cent or more. A lot of hard work is being wasted. Twitter recently introduced “sponsored tweets” that sponsors pay to have inserted into your timeline even though you are not following the sponsors. They’re not re-tweets from someone you follow, but unsolicited and unrecommended advertisements… spam, by any other name. You know who else gives away free samples and then, when people are hooked, charges through the nose for the same product? Heroin dealers. It’s a very effective business strategy – and a widely despised one. In olden days, like the 1980s, social networks were called “online services.” CompuServe, Prodigy, America Online (now just AOL), and some of the largest dial-up Bulletin Board Systems (BBSes) were the Facebook and LinkedIn and Twitter of today. They were more honest in their business strategy, telling everyone up front, “We’ll give you a month’s free trial, but after that it’s going to cost you to stay here.” You might not like the price, but at least you had fair notice of what you were getting into. Not so with heroin dealers, who pretend to be your generous buddy until you’re dependent upon them, then nickel and dime you to death. The Internet killed the old-school online services by enabling people to connect with whomever they wished, and do whatever they liked with their connections. The intermediary’s role became superfluous, so the intermediaries could not charge enough to survive. I believe the same thing will begin happening to today’s social networks as they attempt to get more money from members, by charging for more and more popular features that once were free. People will simply go build their own Web sites, with forums and private message systems and e-commerce stores and whatever else they want. It's already happening with the surging popularity of services like Blogger, WordPress, and Tumblr. If folks don't trust or prefer not to use an established service provider, even the cheapest web hosting accounts have drop-in components for those who want to roll their own blogs, forums, photo sharing or even online stores. Isn't that the beauty of the Internet... leveling the playing field, and putting the power to publish in the hands of Everyman, instead of the Elite Few? They’ll spread the word about their sites by email, instant messaging, Skype, and maybe newsgroups will make a comeback. They may entice some of their friends on current social platforms to escape those walled gardens. But they won’t need Facebook, LinkedIn or Twitter badly enough to pay for access or “privileges.” It the process, they'll take back ownership of their data and their privacy. And something interesting will happen, I think... The Web will look more like a (social) network of inter-connected individuals, rather than a few large herds of cattle. You think I'm wrong? You may be right, I may be crazy. But wouldn't it be a nice change? A Gaping Hole in Internet Security? Most recent comments on "Are Social Networks Committing Suicide?" josil, here are a couple of sites that give instructions on how to delete your accounts. Yay Bob! I've been online since the early days of good old BBS even before the Internet existed, and have watched this "monetising" effect with interest. All my kids & grandkids want me on Facebook, but I flat out refuse to have anything to do with it or any other social network. Maybe I'm a bit of a grumpy old man but after reading your article I feel vindicated. After all, if someone like yourself is saying this you may very well be right about the future. All I can say is BRING BACK USENET!!!! Great article. Gonna forward it to all my grandkids - HEH HEH! I could never see the point of Facebook or Twitter so I never joined them but I did join Linkedin for some obscure reason, I think because here in the UK it is more of a business to business setup and I thought that there might be some benefit. old crap, Joe Soap has connected with ???? and do you know any of these people etc.etc. Its like trying to get rid of bugs, any tips Bob for a clean break? LinkedIn is the worst one for being deceitful by taking my address book and sending everyone invites as if it was coming from me. I should have read more but it is just wrong of them to do what they are doing… I dislike all of them. The only reason I stay with Facebook is because of the things everyone and your self have mentioned here. I hope you are right Bob and people smarten up. After reading your article on LinkedIn, in The Rankin File ... I immediately, went to LinkedIn and deleted my account. LinkedIn was totally useless, to me, since, I am retired and do not actively work. As for Facebook ... I am just about to do the same thing ... Completely, delete my account!!! I am getting more and more crap, on my News Feed, that has been added, when a friend or family member updates or posts a status/comment. They may share, something really meaningful and at the bottom of their post, are at least 4 Facebook pages, supposedly "related" to the topic, at hand. Yeah, right!!! First off ... Too many of those suggested Facebook pages, to "Like" ... Have NOTHING to do with what is posted and most of my family or friends would NEVER go to those suggested Facebook pages!!! Example: A Conservative cartoon is posted and the Suggested to "Like" pages, are Liberal minded Facebook pages???!!! Just saying and using that, as an example ... But, I have seen it done. Oh, you can "X" them out, but, so many times, there are boxes and boxes of these suggested FB pages!!! Very frustrating ... Very annoying ... Very crappy idea, in my book. How dare Facebook suggest something, for me? If, I wanted them, I would seek these pages out, myself!!! Just about ready, to completely delete my Facebook Account, too. Never got involved in Twitter ... I can't "text" fast enough or be short enough, in my response. I HATE texting and all who know me, know that and respect my wishes ... To not text me, unless you are sending a picture(s) or a very short message. I think Facebook is a godsend to perverts and voyers, and the unwary do not realize what they write stays forever. In the future a judge may say "40 years ago you said this **** on Facebook" I think it is a dangerous site. Very insightful Bob and I am right in your corner. I cancelled LinkedIn a while back as I saw absolutely no value in it and was getting bombarded every day by some sort of their solicitations. I have never used Twitter and never will. I absolutely hate FB and never post but hang on to it only because some naïve friends use it as the only way to communicate. I hope some day they will wake up. I hope all of them (FB, Twitter and LinkedIn) will crash and burn. You are right Bob. 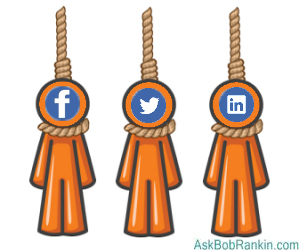 Facebook, LinkedIn and Twitter are committing suicide. I'm glad that they are. I don't like these websites. My friends are on them, but I refuse to communicate with them, using these sites. Good ole email and phone calls work for me. Facebook creeps me out. The only thing I saw on that site were pathetic people, who only talked about silly things, like what they had for lunch or how long it took their dog to do it's morning business. If that is all that you have to talk about, then keep silent. Being a computer troubleshooter for over two decades, I've been online since the early (bad old) days. After all these years, I still haven't found any reason to download an app for or point a browser in the general direction of Facebook, Twitter, LinkedIn or for that matter... CraigsList, eBay or numerous other popular go-to sites. My searches and problem-solving efforts simply don't require landing within those domains nor do any of my entertainment needs. I don't dissuade my clients from using any, but do caution them about privacy concerns. Bob You could not have said it better. I am sorry I let my brother talk me into Linkedin. It is awful and now he hates it. I never used the others and for years told my friends and business associates that only idiots would use FB, Twitter and such. Linkedin was for business but now its worse than all the rest and crooked. I am done with it and will do all I can to spread the word and I hope the rest will do the same. Linkedin should change there name to Turd. I signed up with FB, but cancelled my membership 18 months ago and I would never go back to it or any other social media website. They are very dangerous for it's members. I doubt people have any idea. People can have their ID's stolen. People are stupid to include personal information. I could tell you some real horror stories, but I won't. Good article Bob. About time someone said it! Is there any possibility that sometime soon we will be asked to pay for what appears to be free access to the internet, e-mails etc.? thank you for bringing legitimacy to this argument by putting sense into what's happening. when people urged me due to work or extra-curricular organizations, to ratchet up interest through networks like those you mentioned, there was always something that stopped me..& may have just put a name to it. Here in central England, I have been interwebbing in my small way since 1998. I have always believed that emails allow all necessary messaging: from simple personal messages to properly constructed business epistles. They are also a more secure way to communicate than twittering, ball-bearing-sending, instant missaging, or bace-fooking. My children are now young adults; and sadly both spend much time daily on FaBo, even though they are very aware of the long-term security issues. Personally, I never "follow the herd" without checking moral and security compasses; so I have never subscribed to those dangerously insecure ANTIsocial media. I also expect FaBo, Twtr, et alia will become unfashionable in the near future. Like CB radio, pagers, and pigeon post; all will be remembered only as old-fashioned ways to send messages; possibly after a media-wide security explosion, compromising millions of InFaBoTwit subscribers. About facebook business pages: I think 1 or 2 % of 1000 is 10 or 20, not 100. And 16 % of 1000 is 160. So are you saying exposure per 1000 fans went from 160 down to 10 or 20? EDITOR'S NOTE: You are correct, sorry about the typo. It's the fault of business for basing their popularity on Facebook. That shortsightedness is finally getting them bit on the behind. I don't do business with companies that force me to have a Facebook account in order to interact with them. If I "like" a company I buy its products. I still can't believe they think it's important to have so many virtual "friends". I also feel very good being vindicated by what you wrote in your article. I very much miss the AngelFire and Geocities days. Hope others like them do make a comeback. By the way keep up the good work with all you do. You make me look good to the younger generations. I'm over the hill but my daughter 21 yrs. younger, and friends call me their computer wizard because I read your articles and tell them ahead of time what to look for, what to watch out for, and where to go to solve their high tech problems. I tell them to go sign up for your email letter but their too "busy" to take the time to read, so they get condensed version from me. Thank you. Great writeup Bob, I agree with you these sites will decline, I've been around here since my first computer, a Sinclair ZX80! The biggest beef I have now with business websites is many of them want you to "like" them to get coupons, discounts and other types of perks; I believe this should be banned or illegal, what is the benefit to the business? Ah, THIS THREAD MADE MY DAY. Finally people are getting fed up with this crap. WONDERFUL! That said I do admire the guys who understood there are enough fools to make you a multimillionaire by offering something useless, time consuming and stupid.